At a few librarian meetings in our top-secret underground librarian lair, I mentioned that I use our automation system, Mandarin, to monitor attendance in our library. After that, a few colleagues contacted me and asked for the specifics of my system. I realize that this explanation is lengthy, but I promise that it’s not as scary as it may seem. After the initial setup, this has vastly improved the overall efficiency of our patron management, so much so that I am happy to take the time to outline the process for others. This is what has worked for me, but I’m always looking to refine the process and welcome constructive feedback! I would like to take a moment to point out that we are VERY clear with students that they are always welcome to use the library’s resources for schoolwork or to get a book, and I make every attempt to intervene. This includes identifying missing assignments, working on homework with them, helping them get and stay organized, or hooking them up with someone who can give them extra help. This is part of the reason why I love this system: it alerts me to students who need a little extra assistance in one way or another. Todd and Gary, my automation team/library guardian angels, helped me work out the logistics of this system, from cataloging to reports. I could not have done this without my Mandarin guys! it was significantly more cost effective than commercial alternatives. We ended up spending some money on the cards, but that was negligible compared to the products available at the time. Everytime someone checks in, I see whether or not he or she has books out. It’s a great way to check in with kids about their reading, and also helps us wrangle in those long overdue books. When students arrive, they make a quick stop at the circulation desk to give us their ID numbers. They aren’t required to carry their cards, and the cafeteria upgraded from barcodes to fingerprint scanning, so most students just tell us their numbers. Since we know all of the students in our small district, there’s minimal opportunity for fraud in this practice, even if a kid wanted to pull a fast one. I scan a numbered card and flip it over. I will go into much more detail about the cards in another post, but these are barcodes for a bunch of holdings in the equipment database that are cataloged as chairs. Basically, a study hall student checks out a library chair for the period. Clever, no? Mandarin Guy Todd is responsible for that part. Study hall resumes. Students may come in and out to get books, but I don’t sign them in because I can always keep track of a couple of hall passes at a time, and their presence is accounted for in the circulation statistics. At the end of study hall, I return all of the cards, refill my coffee, and say a few Hail Marys in preparation of the next group of students. 1. Anytime during that day, a student checks out an advisement pass. In the system, this is identical to study hall checkins. 2. The student takes the physical pass with him or her, taking excellent care of it throughout the day to ensure its pristine condition. 3. At the beginning of advisement, students show their passes to their scheduled teachers and head to the library. 4. When they arrive, they drop the pass off at the circulation desk. 5. I stop giving out advisement passes when they run out or the bell rings to signal the beginning of advisement. 6. I run a report and make sure everyone showed up. 7. At the end of advisement, I return the passes in circulation. Notes on this: The number of advisement passes is below my maximum capacity, because I still have students who come for book exchange or to use the computers for homework; the passes are primarily used for the students who are taking advantage of the luxuries of the environment. Occasionally, a teacher holds on to a student, so I have a trustworthy youngster go reclaim the pass. 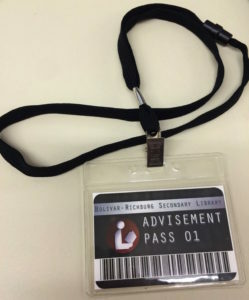 On only one occasion has a student checked out an advisement pass and not showed up, so it seems to be a good system. At any given time, I can run a report of equipment on loan to tell me who is in the library. When we have a fire drill, I run it, send it to the printer, and am out the door just a few seconds behind everyone else. In our web-based program (both Oasis and M5), you can switch to the equipment database and see equipment on loan in about two clicks, which is even faster than the M3 report. On the rare occasion that someone’s whereabouts need to be accounted for, I can always check a patron’s history to see whether or not he or she was checked in during that date and time. I’m sure there’s an argument about privacy out there, but this is only used internally. To me, it’s the same as any other teacher who uses our school system to take attendance, and I don’t have to maintain paper sign-in sheets. When it comes to monthly statistics, I can run the same report that I use for books and specify the equipment database. I also have headphones in the equipment database, so I use the report that splits it by Dewey, but you can use whichever one floats your boat. I hope this offers enough insight for those exploring automated attendance options. I looked into spreadsheet options, and did a semester-long demo of a commercial product in which students sign themselves in, but using Mandarin was much easier for me to manage, and the students openly loathed the extra time and effort it took them to check in using the commercial program. This is also universally applicable to those who don’t use other automation systems, since we’re utilizing basic features. I love this system, and I strongly endorse it. If there’s something I’ve not been clear on, please let me know in the comments.